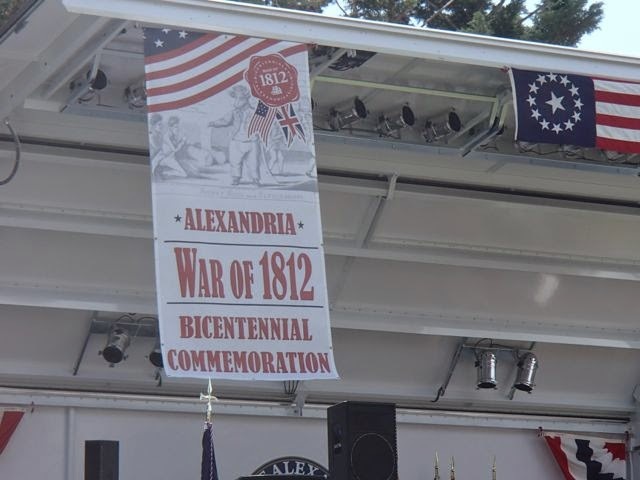 The Alexandria War of 1812 Bicentennial Signature Event commemorated the surrender of Alexandria in 1814. It does seem kind of funny to "celebrate" the surrender, but they did save the much more historic city of Alexandria from having a similar fate as the relatively new city of Washington, D.C. that had just been burned by the British (and some intentionally by the Americans). Today was like the first hot and humid day this summer, so we did not stay long. However, we did enjoy the booths and collecting some brochures for things we want to see as we further explore our new hometown. Mik also picked out a new book to read and add to his military history collection. The event was held at the Waterfront Park. Most of the activities were in the grass area, which is raised up from the path that goes around the park. 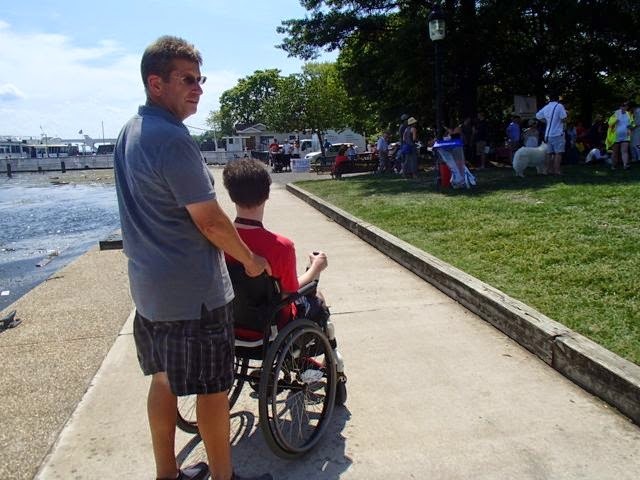 We found a way on to it through the tree area by the shipbuilder's statue; but Mik was glad he chose to use his manual chair today, as this route was mostly blocked by the kids activity tables and it was just easier to go down the curb when we were leaving.